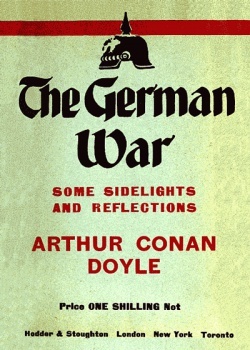 The German War is a book written by Arthur Conan Doyle first published by Hodder & Stoughton Ltd. in december 1914. 2.6 V. The "Contemptible Little Army"
The causes of the war are only of moment to us, at this stage, in that we gain more strength in our arms and more iron in our souls by a knowledge that it is for all that is honourable and sacred for which we fight. What really concerns us is that we are in a fight for our national life, that we must fight through to the end, and that each and all of us must help, in his own fashion, to the last ounce of his strength, that this end may be victory. That is the essence of the situation. It is not words and phrases that we need, but men, men—and always more men. If words can bring the men, then they are of avail. If not, they may well wait for the times to mend. But if there is a doubt in the mind of any man as to the justice of his country's quarrel, then even a writer may find work ready to his hand. And yet they hated us with a most bitter hatred, a hatred which long antedates the days when we were compelled to take a definite stand against them. In all sorts of ways this hatred showed itself—in the diatribes of professors, in the pages of books, in the columns of the Press. Usually it was a sullen, silent dislike. Sometimes it would flame up suddenly into bitter utterance, as at the time of the unseemly dispute around the deathbed of the Emperor's father, or on the occasion of the Jameson Raid. And yet this bitter antagonism was in no way reciprocated in this country. If a poll had been taken at any time up to the end of the century as to which European country was our natural ally, the vote would have gone overwhelmingly for Germany. "America first and then Germany" would have been the verdict of nine men out of ten. But then occurred two events which steadied the easy-going Briton, and made him look more intently and with a more questioning gaze at his distant cousin over the water. Those two events were the Boer War and the building of the German fleet. The first showed us, to our amazement, the bitter desire which Germany had to do us some mischief, the second made us realise that she was forging a weapon with which that desire might be fulfilled. "But it was very different with Germany," he says. "Again and again in the world's history we have been the friends and the allies of these people. It was so in the days of Marlborough, in those of the Great Frederick, and in those of Napoleon. When we could not help them with men we helped them with money. Our fleet has crushed their enemies. And now, for the first time in history, we have had a chance of seeing who were our friends in Europe, and nowhere have we met more hatred and more slander than from the German Press and the German people. Their most respectable journals have not hesitated to represent the British troops—troops every bit as humane and as highly disciplined as their own—not only as committing outrages on person and property, but even as murdering women and children. Such was the prevailing mood of the nation when they perceived Germany, under the lead of her Emperor, following up her expressions of enmity by starting with restless energy to build up a formidable fleet, adding programme to programme, out of all possible proportion to the German commerce to be defended or to the German coastline exposed to attack. Already vainglorious boasts were made that Germany was the successor to Britain upon the seas. "The Admiral of the Atlantic greets the Admiral of the Pacific," said the Kaiser in a message to the Czar. What was Britain to do under this growing menace? So long as she was isolated the diplomacy of Germany might form some naval coalition against her. She took the steps which were necessary for her own safety, and without forming an alliance she composed her differences with France and Russia and drew closer the friendship which united her with her old rival across the Channel. The first-fruit of the new German fleet was the entente cordiale. We had found our enemy. It was necessary that we should find our friends. Thus we were driven into our present combination. But the German method of approaching the problem has never been to ask sympathy and co-operation, but to picture us as a degenerate race from whom anything might be gained by playing upon our imagined weakness and cowardice. A nation which attends quietly to its own sober business must, according to their mediaeval notions, be a nation of decadent poltroons. If we fight our battles by means of free volunteers instead of enforced conscripts, then the military spirit must be dead amongst us. Perhaps, even in this short campaign, they have added this delusion also to the dust-bin of their many errors. But such was their absurd self-deception about the most virile of European races. Did we propose disarmament, then it was not humanitarianism but cowardice that prompted us, and their answer was to enlarge their programme. Did we suggest a navy-building holiday, it was but a cloak for our weakness, and an incitement that they should redouble their efforts. Our decay had become a part of their national faith. At first the wish may have been the father to the thought, but soon under the reiterated assertions of their crazy professors the proposition became indisputable. Bernhardi in his book upon the next war cannot conceal the contempt in which he has learned to hold us. Niebuhr long ago had prophesied the coming fall of Britain, and every year was believed to bring it nearer and to make it more certain. To these jaundiced eyes all seemed yellow, when the yellowness lay only in themselves. Our army, our navy, our Colonies, all were equally rotten. "Old England, old, indeed, and corrupt, rotten through and through." One blow and the vast sham would fly to pieces, and from those pieces the victor could choose his reward. Listen to Professor Treitschke, a man who, above all others, has been the evil genius of his country, and has done most to push it towards this abyss: "A thing that is wholly a sham," he cried, in allusion to our Empire, "cannot, in this universe of ours, endure for ever. It may endure for a day, but its doom is certain." Were ever words more true when applied to the narrow bureaucracy and swaggering Junkerdom of Prussia, the most artificial and ossified sham that ever our days have seen? See which will crack first, our democracy or this, now that both have been plunged into the furnace together. The day of God's testing has come, and we shall see which can best abide it. I have tried to show that we are in no way to blame for the hostility which has grown up between us. So far as it had any solid cause at all it has arisen from fixed factors, which could no more be changed by us than the geographical position which has laid us right across their exit to the oceans of the world. That this deeply-rooted national sentiment, which for ever regarded us as the Carthage to which they were destined to play the part of Rome, would, sooner or later, have brought about war between us, is, in my opinion, beyond all doubt. But it was planned to come at the moment which was least favourable for Britain. "Even English attempts at a rapprochement must not blind us to the real situation," says Bernhardi. "We may, at most, use them to delay the necessary and inevitable war until we may fairly imagine we have some prospect of success." A more shameless sentence was never penned, and one stands marvelling which is the more grotesque—the cynicism of the sentiment, or the folly which gave such a warning to the victim. For be it remembered that Bernhardi's words are to be taken very seriously, for they are not the ravings of some Pan-German monomaniac, but the considered views of the foremost military writer of Germany, one who is in touch with those inner circles whose opinions are the springs of national policy. "Our last and greatest reckoning is to be with Great Britain," said the bitter Treitschke. Sooner or later the shock was to come. Germany sat brooding over the chessboard of the world waiting for the opening which should assure a winning game. So far all had worked well for German plans. Those of the British public who were familiar with the past and could look into the future might be well aware that our interests were firmly bound with those of France, and that if our faggots were not tied together they would assuredly be snapped each in its turn. But the unsavoury assassination which had been so cleverly chosen as the starting-point of the war bulked large in the eyes of our people, and, setting self-interest to one side, the greater part of the public might well have hesitated to enter into a quarrel where the cause seemed remote and the issues ill-defined. What was it to us if a Slav or a Teuton collected the harbour dues of Salonica! So the question might have presented itself to the average man who in the long run is the ruler of this country and the autocrat of its destinies. In spite of all the wisdom of our statesmen, it is doubtful if on such a quarrel we could have gained that national momentum which might carry us to victory. But at that very moment Germany took a step which removed the last doubt from the most cautious of us and left us in a position where we must either draw our sword or stand for ever dishonoured and humiliated before the world. The action demanded of us was such a compound of cowardice and treachery that we ask ourselves in dismay what can we ever have done that could make others for one instant imagine us to be capable of so dastardly a course? Yet that it was really supposed that we could do it, and that it was not merely put forward as an excuse for drawing us into war, is shown by the anger and consternation of the Kaiser and his Chancellor when we drew back from what the British Prime Minister has described as "an infamous proposal." One has only to read our Ambassador's description of his interview with the German Chancellor after our decision was announced, "so evidently overcome by the news of our action," to see that through some extraordinary mental aberration the German rulers did actually believe that a vital treaty with Britain's signature upon it could be regarded by this country as a mere "scrap of paper." As a matter of fact, the General Staff had got ahead of the diplomatists, and the German columns were already over the border while the point was being debated at Berlin. There was no retreat from the position which had been taken up. "It is to us a vital matter of strategy and is beyond argument," said the German soldier. "It is to us a vital matter of honour and is beyond argument," answered the British statesman. The die was cast. No compromise was possible. Would Britain keep her word or would she not? That was the sole question at issue. And what answer save one could any Briton give to it? "I do not believe," said our Prime Minister, "that any nation ever entered into a great controversy with a clearer conscience and stronger conviction that she is fighting, not for aggression, not for the maintenance of her own selfish interest, but in defence of principles the maintenance of which is vital to the civilisation of the world." So he spoke, and History will endorse his words, for we surely have our quarrel just. What have we to gain if we win? That we have nothing material to gain, no colonies which we covet, no possessions of any sort that we desire, is the final proof that the war has not been provoked by us. No nation would deliberately go out of its way to wage so hazardous and costly a struggle when there is no prize for victory. But one enormous indirect benefit we will gain if we can make Germany a peaceful and harmless State. We will surely break her naval power and take such steps that it shall not be a menace to us any more. It was this naval power, with its rapid increase, and the need that we should ever, as Mr. Churchill has so well expressed it, be ready at our average moment to meet an attack at their chosen moment—it was this which has piled up our war estimates during the last ten years until they have bowed us down. With such enormous sums spent upon ships and guns, great masses of capital were diverted from the ordinary channels of trade, while an even more serious result was that our programmes of social reform had to be curtailed from want of the money which could finance them. Let the menace of that lurking fleet be withdrawn—the nightmare of those thousand hammers working day and night in forging engines for our destruction, and our estimates will once again be those of a civilised Christian country, while our vast capital will be turned from measures of self-protection to those of self-improvement. Should our victory be complete, there is little which Germany can yield to us save the removal of that shadow which has darkened us so long. But our children and our children's children will never, if we do our work well now, look across the North Sea with the sombre thoughts which have so long been ours, while their lives will be brightened and elevated by money which we, in our darker days, have had to spend upon our ships and our guns. There is a settled and assured future if we win. There is darkness and trouble if we lose. But if we take a broader sweep and trace the meanings of this contest as they affect others than ourselves, then ever greater, more glorious are the issues for which we fight. For the whole world stands at a turning-point of its history, and one or other of two opposite principles, the rule of the soldier or the rule of the citizen, must now prevail. In this sense we fight for the masses of the German people, as some day they will understand, to free them from that formidable military caste which has used and abused them, spending their bodies in an unjust war and poisoning their minds by every device which could inflame them against those who wish nothing save to live at peace with them. We fight for the strong, deep Germany of old, the Germany of music and of philosophy, against this monstrous modern aberration the Germany of blood and of iron, the Germany from which, instead of the old things of beauty, there come to us only the rant of scolding professors with their final reckonings, their Welt-politik, and their Godless theories of the Superman who stands above morality and to whom all humanity shall be subservient. Instead of the world-inspiring phrases of a Goethe or a Schiller, what are the words in the last decade which have been quoted across the sea? Are they not always the ever-recurring words of wrath from one ill-balanced man? "Strike them with the mailed fist." "Leave such a name behind you as Attila and his Huns." "Turn your weapons even upon your own flesh and blood at my command." These are the messages which have come from this perversion of a nation's soul. How could an honest German whose mind was undebauched by a controlled Press justify such an interference as that? He is or should be aware that in annexing Bosnia, Austria was tearing up a treaty without the consent of the other signatories, and that his own country was supporting and probably inciting her ally to this public breach of faith. Could he honestly think that this was right? And, finally, he must know, for his own Chancellor has publicly proclaimed it, that the Invasion of Belgium was a breach of international right, and that Germany, or rather, Prussia, had perjured herself upon the day that the first of her soldiers passed over the frontier. How can he explain all this to himself save on a theory that might is right, that no moral law applies to the Superman, and that so long as one hews one's way through the rest can matter little? To such a point of degradation have public morals been brought by the infernal teachings of Prussian military philosophy, dating back as far as Frederick the Second, but intensified by the exhortations of Press and professors during our own times. The mind of the average kindly German citizen has been debauched and yet again debauched until it needed just such a world crisis as this to startle him at last from his obsession and show him his position and that of his country in its true relation with humanity and progress. Thus I say that for the German who stands outside the ruling classes our victory would bring a lasting relief, and some hope that in the future his destiny should be controlled by his own judgment and not by the passions or interests of those against whom he has at present no appeal. A system which has brought disaster to Germany and chaos to all Europe can never, one would think, be resumed, and amid the debris of his Empire the German may pick up that precious jewel of personal freedom which is above the splendour of foreign conquest. A Hapsburg or a Hohenzollern may find his true place as the servant rather than the master of a nation. But apart from Germany, look at the effects which our victory must have over the whole wide world. Everywhere it will mean the triumph of reasoned democracy, of public debate, of ordered freedom in which every man is an active unit in the system of his own government; whilst our defeat would stand for a victory to a privileged class, the thrusting down of the civilian by the arrogance and intolerance of militarism, and the subjection of all that is human and progressive to all that is cruel, narrow, and reactionary. This is the stake for which we play, and the world will lose or gain as well as we. You may well come, you democratic over-sea men of our blood, to rally round us now, for all that you cherish, all that is bred in your very bones, is that for which we fight. And you, lovers of Freedom in every land, we claim at least your prayers and your wishes, for if our sword be broken you will be the poorer. But fear not, for our sword will not be broken, nor shall it ever drop from our hands until this matter is for ever set in order. If every ally we have upon earth were to go down in blood and ruin, still would we fight through to the appointed end. Defeat shall not daunt us. Inconclusive victory shall not turn us from our purpose. The grind of poverty and the weariness of hopes deferred shall not blunt the edge of our resolve. With God's help we shall go to the end, and when that goal is reached it is our prayer that a new era shall come as our reward, an era in which, by common action of State with State, mutual hatreds and strivings shall be appeased, land shall no longer be estranged from land, and huge armies and fleets will be nightmares of the past. Thus, as ever, the throes of evil may give birth to good. Till then our task stands clear before us—a task that will ask for all we have in strength and resolution. Have you who read this played your part to the highest? If not, do it now, or stand for ever shamed. It is instructive and interesting now, before fresh great events and a new situation obliterate the old impressions, to put it on record how things seemed to some of us before the blow fell. A mental position often seems incredible when looked back to from some new standpoint. I am one of those who were obstinate in refusing to recognise Germany's intentions. I argued, I wrote, I joined the Anglo-German Friendship Society; I did everything I could for the faith that was in me. But early last year my views underwent a complete change, and I realised that I had been wrong, and that the thing which seemed too crazy and too wicked to be true actually was true. I recorded my conversion at the time in an article entitled "Great Britain and the Next War" in the Fortnightly of March, and reading over that article I find a good deal which fits very closely to the present situation. Forecasts are dangerous, but there is not much there which I would wish to withdraw. What brought about my change of view was reading Bernhardi's book on Germany and the next war. Up to then I had imagined that all this sabre-rattling was a sort of boyish exuberance on the part of a robust young nation which had a fancy to clank about the world in jackboots. Some of it also came, as it seemed to me, from a perfectly natural jealousy, and some as the result of the preaching of those extraordinary professors whose idiotic diatribes have done so much to poison the minds of Young Germany. This was clear enough. But I could not believe that there was a conspiracy hatching for a world-war, in which the command of the sea would be challenged as well as that of the land. No motive seemed to me to exist for so monstrous an upheaval, and no prize to await Germany, if she won, which could at all balance her enormous risks if she lost. Besides, one imagined that civilisation and Christianity did stand for something, and that it was inconceivable that a nation with pretensions to either the one or the other could at this date of the world's history lend itself to a cold-blooded, barbarous conspiracy by which it built up its strength for a number of years with the intention of falling at a fitting moment upon its neighbours, without any cause of quarrel save a general desire for aggrandisement. All this, I say, I could not bring myself to believe. But I read Bernhardi's book, and then I could not help believing. I wrote an article in the hope that others who had been as blind as myself might also come to see the truth. For who was Bernhardi? He was one of the most noted officers in the German army. And here was a book addressed to his own fellow-countrymen, in which these sentiments were set forth. You could not set such a document aside and treat it as of no account. As I said at the time, "We should be mad if we did not take very serious notice of the warning." But the strange thing is that there should have been a warning. There is a quaint simplicity in the German mind, which has shown itself again and again in the recent events. But this is surely the supreme example of it. One would imagine that the idea that the book could be translated and read by his intended victims had never occurred to the author. As a famous soldier, it is impossible to believe that he was not in touch with the General Staff, and he outlines a policy which has some reason, therefore, to be looked upon as an official one. It is as bright a performance as if some one on Lord Roberts's staff had written a description of the Paardeberg flank march and sent it to Cronje some weeks before it was carried out. And yet it was not an isolated example, for Von Edelsheim, who actually belongs to this amazing General Staff, published a shorter sketch, setting forth how his country would deal with the United States—an essay which is an extraordinary example of bombastic ignorance. Such indiscretions can only be explained as manifestations of an inflated national arrogance, which has blown itself up into a conviction that Germany was so sure of winning that it mattered little whether her opponents were upon their guard or not. But Bernhardi's programme, as outlined in his book, is actually being carried through. The whole weight of the attack was to be thrown upon France. Russia was to be held back during her slow mobilisation, and then the victorious legions from Paris were to thunder across in their countless troop trains from the western to the eastern firing-line. Britain was to be cajoled into keeping aloof until her fate was ripe. Then her fleet was to be whittled down by submarines, mines, and torpedo-boats until the numbers were more equal, when the main German fleet, coming from under the forts of Wilhelmshaven, should strike for the conquest of the sea. Such were the plans, and dire the fate of the conquered. They were in accordance with the German semi-official paper, which cried on the day before the declaration of war: "We shall win—and when we do, 'Vae victis!'" With France it was to be a final account. Our own fate would be little better. It needs a righteous anger to wage war to the full, and we can feel it when we think of the long-drawn plot against us, and of the fate which defeat would bring. And there is his much-vaunted military organisation. An American friend of mine, who had means of forming an opinion, remarked to me, "Yes, it is a huge and smooth-running machine, with delicate adjustments. Like all such machines, if a few cogwheels stuck the whole might racket itself to pieces." A cogwheel stuck at Liége, another may stick before long, and it all depends on how the machine can adjust itself. The lesson of history is ominous. The Prussians of Jena and Auerstadt were men who had been swollen up by the tradition of Frederick's prowess. Yet in a single day their defeat was so great and their power of recuperation so slight that they were utterly dispersed, and their country for seven years ceased to exist as a factor in European politics. They have always been great winners. They have not always been great in adversity. How will they now stand this test if it should come their way? I have been interesting and exasperating myself, during a most untimely illness, by working through a part of the literature of German Imperial Expansion. I know that it is only a part, and yet when I look at this array—Treitschke and Bernhardi, Schiemann and Hasse, Bley, Sybel, "Gross-Deutschland" and "Germania Triumphans" — it represents a considerable body of thought. And it is the literature of the devil. Not one kindly sentiment, not one generous expression, is to be found within it. It is informed with passionate cupidity for the writer's country and unreasoning, indiscriminate hatred and jealousy towards everything outside it—above all, towards the British Empire. How could such a literature fail to bring about a world-coalition against the country which produced it! Were there no Germans who foresaw so obvious a result? The whole tendency of the doctrine is that Germany should, artichoke fashion, dismember the world. Not a word is said as to the world suddenly turning and dismembering her. But was not that the only protection against such monstrous teaching as these books contain? The actual policy of State was conducted on the very lines of these teachings, where the devilish doctrine that war should be for ever lurking in a statesman's thoughts, that he should be prepared to pounce upon a neighbour should it be in a state of weakness, and that no treaty or moral consideration should stay his hand, is repeated again and again as the very basis of all state-craft. At the time of the Agadir crisis we have the German Minister of Foreign Affairs openly admitting that he took the view of the fanatical Pan-Germans. "I am as good a Pan-German as you," said Kiderlen-Waechter to the representative of the League. Each was as good or as bad as the other, for all were filled with the same heady, pernicious stuff which has brought Europe to chaos. Where, now, is that "deep, patient Germany" of which Carlyle wrote? Was ever a nation's soul so perverted, so fallen from grace! Read this mass of bombast—learned bombast of professors, vulgar bombast of Lokal-Anzeigers and the like, but always bombast. Wade through the prophetic books with their assumption that Britain must perish and Germany succeed her; consult the scolding articles and lectures, so narrow, ungenerous, and boastful in their tone, so utterly wanting in the deeper historical knowledge or true reading of a rival's character; see the insane Pan-German maps, with their partitions of Europe for the year 1915 or thereabouts; study the lectures of the crazy professors, with their absurd assumption of accurate knowledge and their extraordinary knack of getting every fact as wrong as it could possibly be—take all this together, and then say whether any nation has ever in this world been so foolishly and utterly misled as have the Germans. "The British Army was worthless; its presence on the Continent, even if it could come, was immaterial. "Britain herself was absolutely decadent. "Britain's commerce could be ruined by the German cruisers. "The United States would fall upon us if we were in trouble. "Canada and Australia were longing to break away from the Empire. "The Boers were eager to reconquer South Africa. "The Empire was an artificial collection of States which must fly to pieces at the first shock." There is one phase of their doctrines which has, perhaps, received less attention than it deserves. It will be found very fully treated in Professor Usher's book on Pan-Germanism, which, coming from an American authority who seems to have studied his subject very thoroughly, has the merit of impartiality. This proposition is that just as a treaty is only a scrap of paper, so also is a bond or debenture, and that just as the highest interest of a nation may at any moment override ordinary morality, the same vital urgency may justify anything in the nature of repudiation of debt. This is not to be done on account of inability to pay the debt; but through a deliberate, cold-blooded plot to weaken the creditor by robbing him of his property. Modern Germany has been largely built up by foreign capital. In war, if Germany is conquered the debt necessarily holds good. But if Germany wins, part of her reward of victory is the complete repudiation of all debts. Thus the glorious or inglorious prize of success would be, that all her vast industrial plant would be freed from every debenture and start without an encumbrance, a free present from the enemy. This example, they hope, would lead other nations to do the same, and so still further ruin the finances of England and France, which are the great lending nations of the earth. They frankly admit that such a coup would make it very difficult for their nation to borrow money again, but on the other hand, they would have made such an immense profit over the transaction that they would be able to go on for many years without any need of more capital. "To secure so stupendous a result as this," said the American Professor, "is well worth the expenditure of money for building a fleet. That money, so far as the German nation is concerned, is merely invested in an enterprise from which they confidently expect returns perhaps a hundred-fold." As to the morality of this transaction, the Professor, who has certainly no anti-German bias, expresses their views very plainly. It is the same as Frederick the Great's views as to the morality of treaties which have descended with such fatal effects upon his successor on the Prussian throne. Once admit such anti-social theories and there is no end to their application. Here it is in the domain of economics just as shameless as in that of politics. "Once more," says the Professor, "the Germans hear around them our cries against the morality of this procedure. The Germans refuse to recognise as moral anything which jeopardises their national existence." They are to be the judges of what these are, and if repudiation of debt is considered to be one of them, then all debt may be repudiated. They will not put their views into practice this time because they will not be the victors, but when the reconstruction of Germany begins and she comes once again as a chastened borrower into the market-place of the world, it would be well to have some assurance as to how far she retains these views upon commercial morality. But I have visions of a really chastened Germany, of a Germany which has sloughed all this wicked nonsense, which has found her better self again, and which is once more that "deep, patient Germany" with which I began this essay. She never can be now what she could so easily have been. She could have continued indefinitely to extend from Poland to the Vosges, one vast community, honoured by all for industry and for learning, with a huge commerce, a happy, peaceful, prosperous population, and a Colonial system which, if smaller than that of nations which were centuries older in the field, would at least be remarkable for so short a time. None of these things would the world have grudged her, and in the future as in the past she would have found in the British Dominions and in Great Britain herself an entry for her products as free as if she were herself part of the Empire. It will be a fascinating task for the historian of the immediate future to work out the various strands of evidence which seem to be independent and yet when followed up converge upon the central purpose of a prearranged war for the late summer of 1914 — a war in which Germany should be the prime mover and instigator and Austria the dupe and catspaw. Of course, there are some great facts patent to all the world. There is the sudden rapid acceleration of German preparations for the last two years, the great increase of the army with the colours, and the special emergency tax which was to bring in fifty millions of money. Looking back, we can see very clearly that these things were the run before the jump. Germany at the moment of declaring war had accumulated by processes extending over years all the money which by borrowing or taxation she could raise, and she cannot really expect the rest of the world to believe that it was a mere coincidence that a crisis came along at that particular and favourable moment. All the evidence tends to show that the long-planned outbreak—the "letting-go" as it was called in Germany—was carefully prepared for that particular date and that the Bosnian assassinations had nothing whatever to do with the matter. A pretext could very easily be found, as Bernhardi remarks, and if the Crown Prince of Austria were still alive and well we should none the less have found ourselves at death-grips with the Kaiser over the Belgian infraction. But there is another matter which will insist on coming back into one's thoughts when one reviews the events which preceded the war. I was in Canada in June, and the country was much disturbed by the fact that a shipload of Hindus had arrived at Vancouver, and had endeavoured to land in the face of the anti-Asiatic immigration laws. It struck me at the time as a most extraordinary incident, for these Indians were not the usual Bengalee pedlars, but were Sikhs of a proud and martial race. What could be their object in endeavouring to land in Canada, when the climate of that country would make it impossible for them to settle in it? It was a most unnatural incident, and yet a most painful one, for the British Government was placed in the terrible dilemma of either supporting Canada against India or India against Canada. Could anything be better calculated to start an agitation in one country or the other? The thing was inexplicable at the time, but now one would wish to know who paid for that ship and engineered the whole undertaking. I believe it was one more move on Germany's world-wide board. However, the point of my reminiscence is that on this tour I, being at that time a champion of Anglo-German friendship, heard continual discussions, chiefly on the side of British officers, several of whom were experts on German matters, as to when the impending war would be forced upon us. The date given was always 1914 or 1915. When I asked why this particular year, the answer was that the German preparations would be ready by then, and especially the widening of the Kiel Canal, by which the newer and larger battleships would be able to pass from the Baltic to the North Sea. It says something for the foresight of these officers that this widening was actually finished on June 24 of this year, and within six weeks the whole of Europe was at war. I am bound to admit that they saw deeper into the future than I did, and formed a truer estimate of our real relations with our fellow-voyagers. "Surely you feel more friendly to them now," said I at the end to one distinguished officer. "All I want with them now is to fight them," said he. We have all been forced to come round to his point of view. This insanity was based upon the universal supposition that the Germans were the Lord's chosen people, that in the words of Buy, they were "the most cultured people, the best settlers, the best warriors"—the best everything. Having got that idea thoroughly infused into their very blood, the next step was clear. If they were infinitely the best people living amidst such tribes as "the barbarous Russians, the fickle French, the beastly Servians and Belgians," to quote one of their recent papers, then why should they not have all the best things in the world? If they were really the most powerful, who could gainsay them? They need not do it all at once, but two great national efforts would give them the whole of unredeemed Germany, both shores of the Rhine down to the sea, the German cantons of Switzerland, and, in conjunction with Austria, the long road that leads to Salonica. All local causes and smaller details sink into nothing compared with this huge national ambition which was the real driving force at the back of this formidable project. And it was a very formidable project. If such things could be settled by mere figures and time-tables without any reference to the spirit and soul of the nations, it might very well have succeeded. I think that we are not indulging too far in national complacency if we say that without the British army—that negligible factor—it would for the time at least have succeeded. Had the Germans accomplished their purpose of getting round the left wing of the French, it is difficult to see how a debacle could have been avoided, and it was our little army which stood in the pass and held it until that danger was past. It is certain now that the huge sweep of the German right had never been allowed for, that the French troops in that quarter were second-line troops, and that it was our great honour and good fortune to have dammed that raging torrent and stopped the rush which must have swept everything before it until it went roaring into Paris. And yet how many things might have prevented our presence at the right place at the right time, and how near we were to a glorious annihilation upon that dreadful day when the artillery of five German army corps—eight hundred and thirty guns in all—were concentrated upon Smith-Dorrien's exhausted men. The success or failure of the great conspiracy hung upon the over-matched British covering batteries upon that one critical afternoon. It was the turning-point of the history of the world. V. The "Contemptible Little Army"
Spur us with scorn, and strengthen us with hate." An army which has preserved the absurd Paradeschritt, an exercise which is painful to the bystander, as he feels that it is making fools of brave men, must have a tendency to throw back to earlier types. These Germans have been trained in peace and upon the theory of books. In all that vast host there is hardly a man who has previously stood at the wrong end of a loaded gun. They live on traditions of close formations, vast cavalry charges, and other things which will not fit into modern warfare. Braver men do not exist, but it is the bravery of men who have been taught to lean upon each other, and not the cold, self-contained, resourceful bravery of the man who has learned to fight for his own hand. The British have had the teachings of two recent campaigns fought with modern weapons—that of the Tirah and of South Africa. Now that the reserves have joined the colours there are few regiments which have not a fair sprinkling of veterans from these wars in their ranks. The Pathan and the Boer have been their instructors in something more practical than those Imperial Grand Manoeuvres where the all-highest played with his puppets in such a fashion that one of his generals remarked that the chief practical difficulty of a campaign so conducted would be the disposal of the dead. After all the efforts of the General Staff the result when shown upon the field of battle has filled our men with a mixture of admiration and contempt—contempt for the absurd tactics, admiration for the poor devils who struggle on in spite of them. Listen to the voices of the men who are the real experts. Says a Lincolnshire sergeant, "They were in solid square blocks, and we couldn't help hitting them." Says Private Tait (2nd Essex), "Their rifle shooting is rotten. I don't believe they could hit a haystack at 100 yards." "They are rotten shots with their rifles," says an Oldham private. "They advance in close column, and you simply can't help hitting them," writes a Gordon Highlander. "You would have thought it was a big crowd streaming out from a Cup-tie," says Private Whitaker of the Guards. "It was like a farmer's machine cutting grass," so it seemed to Private Hawkins of the Coldstreams. "No damned good as riflemen," says a Connemara boy. "You couldn't help hitting them. As to their rifle fire, it was useless." "They shoot from the hip, and don't seem to aim at anything in particular." These are the opinions of the practical men upon the field of battle. Surely a poor result from the 200 volumes a year, and all the weighty labours of the General Staff! "Artillery nearly as good as our own, rifle fire beneath contempt," that is the verdict. How will the well-taught Paradeschritt avail them when it comes to a stricken field? But let it not seem as if this were meant for disparagement. We should be sinking to the Kaiser's level if we answered his "contemptible little army" by pretending that his own troops are anything but a very formidable and big army. They are formidable in numbers, formidable, too, in their patriotic devotion, in their native courage, and in the possession of such material, such great cannon, aircraft, machine guns, and armoured cars, as none of the Allies can match. They have every advantage which a nation would be expected to have when it has known that war was a certainty, while others have only treated it as a possibility. There is a minuteness and earnestness of preparation which are only possible for an assured event. But the fact remains, and it will only be brought out more clearly by the Emperor's unchivalrous phrase, that in every arm the British have already shown themselves to be the better troops. Had he the Froissart spirit within him he would rather have said: "You have to-day a task which is worthy of you. You are faced by an army which has a high repute and a great history. There is real glory to be won to-day." Had he said this, then, win or lose, he would not have needed to be ashamed of his own words—the words of an ungenerous spirit. And yet under the pessimism of such men as he there is a curious contradictory assurance that there are no troops like our own. The late Lord Goschen used to tell a story of a letter that he had from a captain in the Navy at the time when he was First Lord. This captain's ship was lying alongside a foreign cruiser in some port, and he compared in his report the powers of the two vessels. Lord Goschen said that his heart sank as he read the long catalogue of points in which the British ship was inferior—guns, armour, speed—until he came to the postscript, which was: "I think I could take her in twenty minutes." But above all I look forward to the development of our mounted riflemen. This I say in no disparagement of our cavalry, who have done so magnificently. But the mounted rifleman is a peculiarly British product—British and American—with a fresh edge upon it from South Africa. I am most curious to see what a division of these fellows will make of the Uhlans. It is good to see that already the old banners are in the wind—Lovat's Horse, Scottish Horse, King Edward's Horse, and the rest. All that cavalry can do will surely be done by our cavalry. But I have always held, and I still very strongly hold, that the mounted rifleman has it in him to alter our whole conception of warfare, as the mounted archer did in his day; and now in this very war will be his first great chance upon a large scale. Ten thousand well-mounted, well-trained riflemen, young officers to lead them, all broad Germany with its towns, its railways, and its magazines before them—there lies one more surprise for the doctrinaires of Berlin. When one writes with a hot heart upon events which are still recent one is apt to lose one's sense of proportion. At every step one should check oneself by the reflection as to how this may appear ten years hence, and how far events which seem shocking and abnormal may prove themselves to be a necessary accompaniment of every condition of war. But a time has now come when in cold blood, with every possible restraint, one is justified in saying that since the most barbarous campaigns of Alva in the Lowlands, or the excesses of the Thirty Years' War, there has been no such deliberate policy of murder as has been adopted in this struggle by the German forces. This is the more terrible since these forces are not, like those of Alva, Parma, or Tilly, bands of turbulent and mercenary soldiers, but they are the nation itself, and their deeds are condoned or even applauded by the entire national Press. It is not on the chiefs of the army that the whole guilt of this terrible crime must rest, but it is upon the whole German nation, which for generations to come must stand condemned before the civilised world for this reversion to those barbarous practices from which Christianity, civilisation, and chivalry had gradually rescued the human race. They may, and do, plead the excuse that they are "earnest" in war, but all nations are earnest in war, which is the most desperately earnest thing of which we have any knowledge. How earnest we are will be shown when the question of endurance begins to tell. But no earnestness can condone the crime of the nation which deliberately breaks those laws which have been endorsed by the common consent of humanity. War may have a beautiful as well as a terrible side, and be full of touches of human sympathy and restraint which mitigate its unavoidable horror. Such have been the characteristics always of the secular wars between the British and the French. From the old glittering days of knighthood, with their high and gallant courtesy, through the eighteenth-century campaigns where the debonair guards of France and England exchanged salutations before their volleys, down to the last great Napoleonic struggle, the tradition of chivalry has always survived. We read how in the Peninsula the pickets of the two armies, each of them as earnest as any Germans, would exchange courtesies, how they would shout warnings to each other to fall back when an advance in force was taking place, and how, to prevent the destruction of an ancient bridge, the British promised not to use it on condition that the French would forgo its destruction — an agreement faithfully kept upon either side. Could one imagine Germans making war in such a spirit as this? Think of that old French bridge, and then think of the University of Louvain and the Cathedral of Rheims. What a gap between them—the gap that separates civilisation from the savage! As to the treatment of Belgium, what has it been but murder, murder all the way? From the first days at Visé, when it was officially stated that an example of "frightfulness" was desired, until the present moment, when the terrified population has rushed from the country and thrown itself upon the charity and protection of its neighbours, there has been no break in the record. Compare the story with that of the occupation of the South of France by Wellington in 1813, when no one was injured, nothing was taken without full payment, and the villagers fraternised with the troops. What a relapse of civilisation is here! From Visé to Louvain, Louvain to Aerschott, Aerschott to Malines and Termonde, the policy of murder never fails. Do you imagine that the thing has been exaggerated? Far from it—the volume of crime has not yet been appreciated. Have not many Germans unwittingly testified to what they have seen and done? Only last week we had the journal of one of them, an officer whose service had been almost entirely in France and removed from the crime centres of Belgium. Yet were ever such entries in the diary of a civilised soldier? "Our men behaved like regular Vandals." "We shot the whole lot" (these were villagers). "They were drawn up in three ranks. The same shot did for three at a time." "In the evening we set fire to the village. The priest and some of the inhabitants were shot." "The villages all round were burning." "The villages were burned and the inhabitants shot." "At Leppe apparently two hundred men were shot. There must have been some innocent men among them." "In the future we shall have to hold an inquiry into their guilt instead of merely shooting them." "The Vandals themselves could not have done more damage. The place is a disgrace to our army." So the journal runs on with its tale of infamy. It is an infamy so shameless that even in the German record the story is perpetuated of how a French lad was murdered because he refused to answer certain questions. To such a depth of degradation has Prussia brought the standard of warfare. "We will never forgo our hate. Now, this is just what we should wish to do with Germany, and it is what Germany is rapidly making impossible. She has, in our opinion, fought a brave but a thoroughly foul fight. And now she uses every means to excite a bitter hatred which shall survive the war. The Briton is tolerant and easy-going in times of peace—too careless, perhaps, of the opinion of other nations. But at present he is in a most alert and receptive mood, noting and remembering very carefully every word that comes to him as to the temper of the German people and the prospects of the future. He is by no means disposed to pass over all these announcements of permanent hatred. On the contrary, he is evidently beginning, for the first time since Napoleon's era, to show something approaching to hatred in return. He—and "he" stands for every Briton across the seas as well as for the men of the Islands—makes a practical note of it all, and it will not be forgotten, but will certainly bear very definite fruits. The national thoughts do not come forth in wild poems of hate, but they none the less are gloomy and resentful, with the deep, steady resentment of a nation which is slow to anger. But the pity of it all! We might have had a straight, honest fight, and at the end of it we might have conceded that the German people had been innocently misled, by their military caste and their Press, into the idea that their country was being attacked, and so were themselves guiltless in the matter. They, on their side, might at last have understood that Britain had been placed in such a position by her guarantees to Belgium that it was absolutely impossible that she could stand out of the war. With these mutual concessions, some sort of friendship could possibly have been restored, for it is no one's interest, and least of all ours, that the keystone should be knocked right out of the European arch. But all this has been rendered impossible by these hysterical screamers of hate, and by those methods of murder on land, sea, and in air with which the war has been conducted. Hate is a very catching emotion, and when it translates itself into action it soon glows on either side of the North Sea. With neither race, to use Carlyle's simile, does it blaze like the quick-flaming stubble, but with both it will smoulder like the slow red peat. Are there not even now strong, sane men in Germany who can tell these madmen what they are sowing for the next generation and the one that comes after it? It is not that we ask them to abate the resistance of their country. It is understood that this is a fight to the end. That is what we desire. But let them stand up and fight without reviling; let them give punishment without malice and receive it without wincing; let their press cease from lying, and their prophets from preaching hatred—then, lose or win, there may still be some chance for their future. But, alas! the mischief is already, I fear, too deep. When the seeds are sown, it is hard to check the harvest. Let the impartial critic consider von Müller of the Emden, and then, having surveyed our Press and that of Germany, let him say with whom lies the blame. This essay is of some interest, as it was written two years before the war, and was one of the first attempts to make the public realise the importance of Bernhardi's notorious book. The author follows it by an unpublished essay called "Afterthoughts," in which he examines how far his reading of the future has been justified by the event. A book written by such a man cannot be set aside as the mere ravings of a Pan-Germanic Anglophobe. So far as appears, he is not a Pan-German at all. There is no allusion to that Germania irredentewhich is the dream of that party. He is a man of note, and the first living authority in Germany upon some matters of military science. Does he carry the same weight when he writes of international politics and the actual use of those mighty forces which he has helped to form? We will hope not. But when a man speaks with the highest authority upon one subject, his voice cannot be entirely disregarded upon a kindred one. Besides, he continually labours, and with success, to make the reader understand that he is the direct modern disciple of that main German line of thought which traces from Frederick through Bismarck to the present day. He moves in circles which actually control the actions of their country in a manner to which we have no equivalent. For all these reasons, his views cannot be lightly set aside, and should be most carefully studied by Britons. We know that we have no wish for war, and desire only to be left alone. Unfortunately, it takes two to make peace, even as it takes two to make a quarrel. There is a very clear statement here that the quarrel is imminent, and that we must think of the means, military, naval, and financial, by which we may meet it. Since von Bernhardi's book may not be accessible to every reader of this article, I will begin by giving some idea of the situation as it appears to him, and of the course of action which he foreshadows and recommends. "Again, from the Christian standpoint, we arrive at the same conclusion. Christian morality is based, indeed, on the law of love. 'Love God above all things, and thy neighbour as thyself.' This law can claim no significance for the relations of one country to another, since its application to politics would lead to a conflict of duties. The love which a man showed to another country as such would imply a want of love for his own countrymen. Such a system of politics must inevitably lead men astray. Christian morality is personal and social, and in its nature cannot be political. Its object is to promote morality of the individual, in order to strengthen him to work unselfishly in the interests of the community. It tells us to love our individual enemies, but does not remove the conception of enmity." "Strong, healthy, and flourishing nations increase in numbers. From a given moment they require a continual expansion of their frontiers, they require new territory for the accommodation of their surplus population. Since almost every part of the globe is inhabited, new territory must, as a rule, be obtained at the cost of its possessors—that is to say, by conquest, which thus becomes a law of necessity." "Lastly, in all times the right of conquest by war has been admitted. It may be that a growing people cannot win colonies from uncivilised races, and yet the State wishes to retain the surplus population which the mother country can no longer feed. Then the only course left is to acquire the necessary territory by war. Thus the instinct of self-preservation leads inevitably to war, and the conquest of foreign soil. It is not the possessor, but the victor, who then has the right." "Arbitration treaties must be peculiarly detrimental to an aspiring people, which has not yet reached its political and national zenith, and is bent on expanding its power in order to play its part honourably in the civilised world." "It must be borne in mind that a peaceful decision by an arbitration court can never replace in its effects and consequences a warlike decision, even as regards the State in whose favour it is pronounced." To many of us it would seem a legitimate extension of the author's argument if we said that it would have a virile and bracing effect upon our characters if, when we had a grievance against our neighbour, we refrained from taking it into the law courts, but contented ourselves with breaking his head with a club. However, we are concerned here not so much with the validity of the German general's arguments as with their practical application so far as they affect ourselves. Brushing aside the peace advocates, the writer continues: "To such views, the off-spring of a false humanity, the clear and definite answer must be made that, under certain circumstances, it is not only the right but the moral and political duty of the statesman to bring about a war. The acts of the State cannot be judged by the standard of individual morality." He quotes Treitschke: "The Christian duty of sacrifice for something higher does not exist for the State, for there is nothing higher than it in the world's history—consequently it cannot sacrifice itself to something higher." One would have hoped that a noble ideal and a moral purpose were something higher, but it would be vain to claim that any country, ourselves included, have ever yet lived fully up to the doctrine. And yet some conscious striving, however imperfect, is surely better than such a deliberate negation. Having laid down these general propositions of the value of war, and of the non-existence of international moral obligations, General von Bernhardi then proceeds to consider very fully the general position of Germany and the practical application of those doctrines. Within the limits of this essay I can only give a general survey of the situation as seen by him. War is necessary for Germany. It should be waged as soon as is feasible, as certain factors in the situation tell in favour of her enemies. The chief of these factors are the reconstruction of the Russian fleet, which will be accomplished within a few years, and the preparation of a French native colonial force, which would be available for European hostilities. This also, though already undertaken, will take some years to perfect. Therefore, the immediate future is Germany's best opportunity. Of the German army, which is to be the instrument of this world-drama, General von Bernhardi expresses the highest opinion: "The spirit which animates the troops, the ardour of attack, the heroism, the loyalty which prevail among them, justify the highest expectations. I am certain that if they are soon to be summoned to arms their exploits will astonish the world, provided only that they are led with skill and determination." How their "ardour of attack" has been tested it is difficult to see, but the world will probably agree that the German army is a most formidable force. When he goes on, however, to express the opinion that they would certainly overcome the French, the two armies being approximately of the same strength, it is not so easy to follow his argument. It is possible that even so high an authority as General von Bernhardi has not entirely appreciated how Germany has been the teacher of the world in military matters and how thoroughly her pupils have responded to that teaching. That attention to detail, perfection of arrangement for mobilisation, and careful preparation which have won German victories in the past may now be turned against her, and she may find that others can equal her in her own virtues. "In one way or another we must square our account with France if we wish for a free hand in our international policy. This is the first and foremost condition of a sound German policy, and since the hostility of France once for all cannot be removed by peaceful overtures, the matter must be settled by force of arms. France must be so completely crushed that she can never again come across our path." Let us now turn to General von Bernhardi's views upon ourselves; and, first of all, it is of interest to many of us to know what are those historical episodes which have caused him and many of his fellow-countrymen to take bitter exception to our national record. From our point of view we have repeatedly helped Germany in the past, and have asked for and received no other reward than the consciousness of having co-operated in some common cause. So it was in Marlborough's days. So in the days of Frederick. So also in those of Napoleon. To all these ties, which had seemed to us to be of importance, there is not a single allusion in this volume. On the other hand, there are very bitter references to some other historical events which must seem to us strangely inadequate as a cause for international hatred. We may, indeed, congratulate ourselves as a nation, if no stronger indictment can be made against us than is contained in the book of the German general. The first episode upon which he animadverts is the ancient German grievance of the abandonment of Frederick the Great by England in the year 1761. One would have thought that there was some statute of limitations in such matters, but apparently there is none in the German mind. Let us grant that the premature cessation of a campaign is an injustice to one's associates, and let us admit also that a British Government under its party system can never be an absolutely stable ally. Having said so much, one may point out that there were several mitigating circumstances in this affair. We had fought for five years, granting considerable subsidies to Frederick during that time, and dispatching British armies into the heart of Germany. The strain was very great, in a quarrel which did not vitally affect ourselves. The British nation had taken the view, not wholly unreasonably, that the war was being waged in the interests of Hanover, and upon a German rather than a British quarrel. When we stood out France did the same, so that the balance of power between the combatants was not greatly affected. Also, it may be pointed out as a curious historical fact that this treatment which he so much resented was exactly that which Frederick had himself accorded to his allies some years before at the close of the Silesian campaign. On that occasion he made an isolated peace with Maria Theresa, and left his associates, France and Bavaria, to meet the full force of the Austrian attack. Finally the whole episode has to be judged by the words of a modern writer: "Conditions may arise which are more powerful than the most honourable intentions. The country's own interests—considered, of course, in the highest ethical sense—must then turn the scale." These sentences are not from the work of a British apologist, but from this very book of von Bernhardi's which scolds England for her supposed adherence to such principles. He also quotes, with approval, Treitschke's words: "Frederick the Great was all his life long charged with treachery because no treaty or alliance could ever induce him to renounce the right of free self-determination." Setting aside this ancient grievance of the Seven Years' War, it is of interest to endeavour to find out whether there are any other solid grounds in the past for Germany's reprobation. Two more historical incidents are held up as examples of our perfidy. The first is the bombardment of Copenhagen in 1807, when the British took forcible possession in time of peace of the Danish fleet. It must be admitted that the step was an extreme one, and only to be justified upon the plea of absolute necessity for vital national reasons. The British Government of the day believed that Napoleon was about to possess himself of the Danish fleet and would use it against themselves. Fouché has admitted in his Memoirs that the right was indeed given by a secret clause in the Treaty of Tilsit. It was a desperate time, when the strongest measures were continually being used against us, and it may be urged that similar measures were necessary in self-defence. Having once embarked upon the enterprise, and our demand being refused, there was no alternative but a bombardment of the city with its attendant loss of civilian life. It is not an exploit of which we need be proud, and at the best can only be described as a most painful and unfortunate necessity; but I should be surprised if the Danes, on looking back to it, judge it more harshly than some more recent experiences which they have had at the hands of General von Bernhardi's own fellow-countrymen. That he is himself prepared to launch upon a similar enterprise in a much larger and more questionable shape is shown by his declaration that if Holland will not take sides against England in the next war it should be overrun by the German troops. General von Bernhardi's next historical charge is the bombardment of Alexandria in 1882, which he describes as having been affected upon hypocritical pretences in a season of peace. To those who have a recollection of that event and can recall the anti-European movement of Arabi and the massacre which preceded the bombardment, the charge will appear grotesque. But it is with a patchwork quilt of this sort that this German publicist endeavours to cover the unreasoning, but none the less formidable, jealousy and prejudice which inflame him against this country. The foolish fiction that the British Government declared war against the Boers in order to gain possession of their gold mines is again brought forward, though one would have imagined that even the gutter-Press who exploited it twelve years ago had abandoned it by now. If General von Bernhardi can explain how the British Government is the richer for these mines, or whether a single foreign shareholder has been dispossessed of his stock in them, he will be the first who has ever given a solid fact in favour of this ridiculous charge. In a previous paragraph of his book he declares that it was President Kruger who made the war and that he was praiseworthy for so doing. Both statements cannot be true. If it was President Kruger who made the war, then it was not forced on by Great Britain in order to possess herself of the goldfields. So much for the specific allegations against Great Britain. One can hardly regard them as being so serious as to wipe out the various claims, racial, religious, and historical, which unite the two countries. However, we are only concerned with General von Bernhardi's conclusions, since he declares that his country is prepared to act upon them. There remain two general grounds upon which he considers that Germany should make war upon the British Empire. The first is to act as the champion of the human race in winning what he calls the freedom of the seas. The second is to further German expansion as a world-Power, which is cramped by our opposition. The first of these reasons is difficult to appreciate. British maritime power has been used to ensure, not to destroy, the freedom of the seas. What smallest Power has ever been hindered in her legitimate business? It is only the pirate, the slaver, and the gun-runner who can justly utter such a reproach. If the mere fact of having predominant latent strength upon the water is an encroachment upon the freedom of the sea, then some nation must always be guilty of it. After our mild supremacy we may well say to Germany, as Charles said to James: "No one will assassinate me in order to put you on the throne." Her mandate is unendorsed by those whom she claims to represent. But the second indictment is more formidable. We lie athwart Germany's world ambitions, even as, geographically, we lie across her outlets. But when closely looked at, what is it of which we deprive her, and is its attainment really a matter of such vital importance? Do we hamper her trade? On the contrary, we exhibit a generosity which meets with no acknowledgment, and which many of us have long held to be altogether excessive. Her manufactured goods are welcomed in without a tax, while ours are held out from Germany by a 20 per cent. tariff. In India, Egypt, and every colony which does not directly control its own financial policy, German goods come in upon the same footing as our own. No successful war can improve her position in this respect. There is, however, the question of colonial expansion. General von Bernhardi foresees that Germany is increasing her population at such a pace that emigration will be needed soon in order to relieve it. It is a perfectly natural national ambition that this emigration should be to some place where the settlers need not lose their flag or nationality. But if Great Britain were out of the way, where would they find such a place? Not in Canada, Australia, South Africa, or New Zealand. These States could not be conquered if the Motherland had ceased to exist. General von Bernhardi talks of the high lands of Africa, but already Germany possesses high lands in Africa, and their colonisation has not been a success. Can any one name one single place upon the earth's surface suitable for white habitation from which Germany is excluded by the existence of Great Britain? It is true that the huge continent of South America is only sparsely inhabited, its whole population being about equal to that of Prussia. But that is an affair in which the United States, and not we, are primarily interested, and one which it is not our interest either to oppose or to support. "What we now wish to attain must be fought for and won against a superior force of hostile interests and Powers." "Since the struggle is necessary and inevitable, we must fight it out, cost what it may." "A pacific agreement with England is a will-o'-the-wisp, which no serious German statesman would trouble to follow. We must always keep the possibility of war with England before our eyes and arrange our political and military plans accordingly. We need not concern ourselves with any pacific protestations of English politicians, publicists, and Utopians, which cannot alter the real basis of affairs." "The situation in the world generally shows there can only be a short respite before we once more face the question whether we will draw the sword for our position in the world, or renounce such position once for all. We must not in any case wait until our opponents have completed their arming and decide that the hour of attack has come." "Even English attempts at a rapprochement must not blind us to the real situation. We may at most use them to delay the necessary and inevitable war until we may fairly imagine we have some prospect of success." Such, in condensed form, is the general thesis and forecast of this famous German officer. If it be true, there are evil days coming both for his country and for ours. One may find some consolation in the discovery that wherever he attempts to fathom our feelings he makes the most lamentable blunders. He lays it down as an axiom, for example, that if we were hard-pressed the Colonies would take the opportunity of abandoning us. We know, on the other hand, that it is just such a situation which would bring about the federation of the Empire. He is under the delusion also that there is deep commercial and political jealousy of the United States in this country, and that this might very well culminate in war. We are aware that there is no such feeling, and that next to holding the trident ourselves we should wish to see it in the hands of our American cousins. One thing he says, however, which is supremely true, which all of us would endorse, and which every German should ponder: it is that the idea of a war between Germany and ourselves never entered into the thoughts of any one in this country until the year 1902. Why this particular year? Had the feeling risen from commercial jealousy upon the part of Great Britain, it must have shown itself far earlier than that—as early as the "Made in Germany" enactment. It appeared in 1902 because that was the close of the Boer War, and because the bitter hostility shown by the Germans in that war opened our eyes to the fact that they would do us a mischief if they could. When the German Navy Act of 1900 gave promise that they would soon have the means of doing so, the first thoughts of danger arose, and German policy drove us more and more into the ranks of their opponents. Here, then, General von Bernhardi is right; but in nearly every other reference to our feelings and views he is wrong; so that it is to be hoped that in those matters in which we are unable to check him, such as the course of German thought and of German action in the future, he is equally mistaken. But I repeat that he is a man of standing and reputation, and that we should be mad if we did not take most serious notice of the opinions which he has laid down. I have headed this article "Great Britain and the Next War," since it looks at the arguments and problems which General von Bernhardi has raised in his Germany and the Next War from the British point of view. May it prove that the title is an absurdity and the war an imaginative hypothesis. But I should wish, before I close, to devote a few pages to my view upon the defensive measures of our country. I am well aware that I speak with no expert authority, which makes it the more embarrassing that my opinions do not coincide with those of any one whom I have encountered in this controversy. Still, it is better to be a voice, however small, than an echo. But if, as Von Bernhardi says, such plans are visionary, what is the exact object of a Territorial Army, and, even more, what would be the object of a National Service Army upon compulsory lines for home defence? Is it not a waste of money and energy which might be more profitably employed in some other form? Every one has such an affection and esteem for Lord Roberts—especially if one has the honour of his personal acquaintance—that one shrinks from expressing a view which might be unwelcome to him. And yet he would be the first to admit that it is one's duty to add one's opinion to the debate, if that opinion has been conscientiously formed, and if one honestly believes that it recommends the best course of action for one's country. So far as his argument for universal service is based upon national health and physique, I think he is on ground which no one could attack. But I cannot bring myself to believe that a case has been made out for the substitution of an enforced soldier in the place of the volunteer who has always done so splendidly in the past. Great as is Lord Roberts's experience, he is talking here of a thing which is outside it, for he has never seen an enforced British soldier, and has, therefore, no data by which he can tell how such a man would compare with the present article. There were enforced British sailors once, and I have seen figures quoted to show that of 29,000 who were impressed 27,000 escaped from the Fleet by desertion. It is not such men as these who win our battles. If the crossing were direct from the eastern ports to Antwerp, the danger would become greater. It is less if it should be from Portsmouth to Havre. But this is a transit of seven hours, and the railways from Havre to the Belgian frontier would be insufficient for such a force. No doubt the Straits of Dover would be strongly patrolled by our own torpedo craft, and the crossing would, so far as possible, be made at night, when submarines have their minimum of efficiency; but, none the less, it seems to me that the risk would be a very real and pressing one. What possible patrol could make sure of heading off a squadron of submarines? I should imagine it to be as difficult as to bar the Straits to a school of whales. But supposing such a wholesale tragedy were avoided, and that in spite of the predominance of submarines the army got safely to France or to Belgium, how are we to ensure the safe passage of the long stream of ships which, for many months, would be employed in carrying the needful supplies? We could not do it. The army might very well find itself utterly isolated, with its line of communications completely broken down, at a time when the demand upon the resources of all Continental countries was so great that there was no surplus for our use. Such a state of affairs seems to me to be a perfectly possible one, and to form, with the chance of a disaster to the transports, the greatest danger to which we should be exposed in a German war. But these dangers and the food question, which has already been treated, can all be absolutely provided against in a manner which is not only effective, but which will be of equal value in peace and in war. The Channel Tunnel is essential to Great Britain's safety. Incidentally, it may be noted that General von Bernhardi has a poor opinion of our troops. This need not trouble us. We are what we are, and words will not alter it. From very early days our soldiers have left their mark upon Continental warfare, and we have no reason to think that we have declined from the manhood of our forefathers. He further calls them "mercenaries," which is a misuse of terms. A mercenary is a man who is paid to fight in a quarrel which is not his own. As every British soldier must by law be a British citizen, the term is absurd. What he really means is that they are not conscripts in the sense of being forced to fight, but they are sufficiently well paid to enable the army as a profession to attract a sufficient number of our young men to the colours. SO it was so after all. I write after perusing what was written two years ago. I lean back in my chair and I think of the past. "So it really was so after all," represents the thought which comes to my mind. It seems hardly fair to call it a conspiracy. When a certain action is formulated quite clearly in many books, when it is advocated by newspapers, preached by professors, and discussed at every restaurant, it ceases to be a conspiracy. We may take Bernhardi's book as a text, but it is only because here between two covers we find the whole essence of the matter in an authoritative form. It has been said a thousand times elsewhere. And now we know for all time that these countless scolding and minatory voices were not mere angry units, but that they were in truth the collective voice of the nation. All that Bernhardi said, all that after long disbelief he made some of us vaguely realise, has now actually happened. So far as Germany is concerned it has been fulfilled to the letter. Fortunately so far as other nations have been concerned it has been very different. He knew his own, but he utterly misjudged all else, and in that misjudgment he and his spy-trusting Government have dug a pit for themselves in which they long may flounder. Make war deliberately whenever you think that you may get profit from it. Find an excuse, but let it be an excuse which will give you a strong position before the world and help your alliances. Take advantage of your neighbour's temporary weakness in order to attack him. Pretend to be friendly in order to screen warlike preparations. Do not let contracts or treaties stand in the way of your vital interests. All of these monstrous propositions are to be found in this vade mecum of the German politician and soldier, and each of them has been put in actual practice within a very few years of the appearance of the book. Take each of them in turn. Then again they pretended to be friendly in order to cover hostile preparations. To the very last moment the German Minister in Brussels was assuring the Government of King Albert that nothing but the best intentions animated those whom he represented, and that Belgian neutrality was safe. The written contract was deliberately dishonoured on the false and absurd plea that if they did not dishonour it some one else would. Thus, of the five propositions which had seemed most monstrous and inhuman in Bernhardi's book in 1912, every single one had been put into actual practice by his country in 1914. Those of us who advised at the time that the book should be taken seriously have surely been amply justified. It is a singular thing that Bernhardi not only indicated in a general way what Germany was contemplating, but in his other book upon modern warfare he gives a very complete sketch of the strategic conception which has been followed by the Germans. He shows there how their armies might come through Belgium, how their eastern forces might mark time while the western, which were to consist of the picked troops, would travel by forced marches until they reached the neighbourhood of the coast, or at least the west of Paris, after which the whole line should swing round into France. The chance that by these movements the German right would come into the region of the British expeditionary force is dismissed lightly, since he entirely underestimated the power of such a force, while as to the Belgian army it is hardly admitted as a factor at all. A comparison of the opinions of this great military authority with the actual facts as we have recently known them, must weaken one's faith in the value of expert judgment. He is, for example, strongly of opinion that battles will not as a rule last for more than one day. He has also so high an opinion of the supreme fighting value of the German soldiers, that he declares that they will always fight in the open rather than behind entrenchments. It makes strange reading for us who have seen them disappear from sight into the ground for a month at a time. In what I have said in the previous article of the naval and military position, I find nothing to withdraw, and little to modify. I write with the Germans at Ostend, and yet the possibility of either a raid or an invasion seems to me as remote as it did two years ago. I do not of course refer to an aerial raid, which I look upon as extremely probable, but to a landing in these islands. The submarine which has been used so skilfully against us is an all-powerful defensive weapon in our hands. As to the submarine, I think that I may claim to have foreseen the situation which has actually come upon us. "No blockade," I remarked, "can hold these vessels in harbour, and no skill or bravery can counteract their attack when once they are within striking distance. One could imagine a state of things when it might be found impossible for the greater ships on either side to keep the seas on account of these poisonous craft. No one can say that such a contingency is impossible." It is largely true at the present moment as regards the North Sea. But the submarine will not shake Great Britain as mistress of the seas. On the contrary, with her geographical position, it will, if her internal economic policy be wise, put her in a stronger position than ever. There remains the fiercely debated question of compulsory national service. Even now, with the enemy at the gate, it seems to me to be as open as ever. Would we, under our constitution and with our methods of thought, have had such a magnificent response to Lord Kitchener's appeal, or would we have had such splendid political unanimity in carrying the war to a conclusion, if a large section of the people had started by feeling sore over an Act which caused themselves or their sons to serve whether they wished or not? Personally I do not believe that we should. I believe that the new volunteer armies now under training are of really wonderful material and fired with the very best spirit, and that they will be worth more than a larger force raised by methods which are alien to our customs. I said in my previous essay, "Experience has shown that under warlike excitement in a virile nation like ours the ranks soon fill up, and as the force becomes embodied from the outbreak of hostilities it would rapidly improve in quality." Already those Territorials who were so ignorantly and ungenerously criticised in times of peace are, after nearly three months of camp-life, hardening into soldiers who may safely be trusted in the field. Behind them the greater part of a million men are formed who will also become soldiers in a record time if a desperate earnestness can make them so. It is a glorious spectacle which makes a man thankful that he has been spared to see it. One is more hopeful of our Britain, and more proud of her, now that the German guns can be heard from her eastern shore, than ever in the long monotony of her undisturbed prosperity. Our grandchildren will thrill as they read of the days that we endure. This page was last edited on 22 May 2017, at 18:10.